Cosy apartment with an excellent location - numerous eateries, restaurants, night bars, and coffee-shops, 24 hours open grocery shops and drug stores, ATM machines, boutiques and musical shops, 1 minute walk from Nevsky prospect. 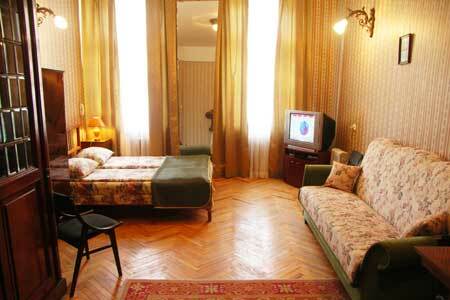 The Moskovsky railway station is 5 minutes walk.The apartment features a room of 25 m² and a kitchen of 6 m². It is located on the 1st floor, no elevator. Street entrance with a key code. Parking is available on the street and in the yard. A guarded parking place is 7 minutes walk. The apartment sleeps 3 guests (a queen size bed and a sofa-bed). Amenities include television, satellite TV, DVD player, telephone, washing machine (no dryer), refrigerator, stove, and kitchen utensils. The apartment has linens, towels, bath amenities and cleaning supplies. The nearest metro station "Ploschad Vosstaniya" is within 1-minute walk.